I’d been asked to photograph the McLaren M7C high wing car for F1 Racing magazine and been invited to shoot McLaren’s own car at their incredible futuristic Tech’ centre where they build the F1 cars and develop the road cars.Like many large organisations McLaren are very particular about who they let through their doors so it’s always exciting to visit but can be a challenging place to work.My luck was in however as I was able to park just outside the area where the M7C had been moved to. 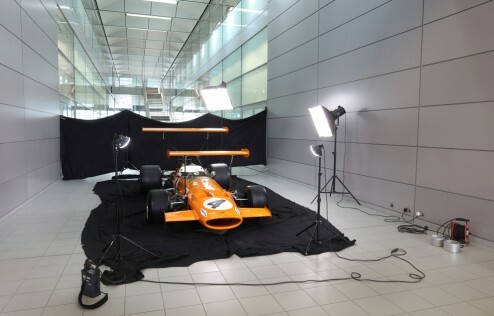 The M7s were the first to use the Cosworth DFV8 which would remain the main power plant for their F1 cars right up until 1983.Drivers for the 1968/9 season were Bruce McLaren and Denny Hulme. The M7C is a snapshot of F1 development with a brand new monococque design and high wings mounted directly onto the suspension offering considerable down force at high speeds. The high wing cars were only used for a few races in 1968 and 1969 before being banned at the Monaco Grand Prix.